Is Australia’s East Coast Housing Upturn Over? The resurgence in house prices that occurred over 2016/17 is likely to be short-lived according to industry analyst and economic forecaster BIS Oxford Economics. House price growth is forecast to slow or even show a decline in some markets over 2017/18 and 2018/19 as a combination of further tightening of lending to investors and rising new stock levels begin to drag on the residential market. According to the company’s Residential Property Prospects 2017 to 2020 report, record new dwelling completions will see most undersupplied markets tip into oversupply, while excess stock in other markets is likely to persist. However, low interest rates and a relatively stable, albeit subdued, economic environment will prevent too many forced sales coming to the market to drive down prices in an American-style crash. Some upside could even begin to come through by 2019/20 as a corresponding slowdown in new dwelling construction sees the slow absorption of some of the excess stock in a number of markets. House price growth since 2012/13 has been largely confined to the Sydney and Melbourne markets, although these cities have been joined by Hobart and Canberra over 2016/17. Other capital cities have experienced only limited house price growth in this time, while house prices in Perth and Darwin have fallen. Price growth in the weaker markets is being stymied by a combination of excess stock and/or a weak local economic environment. BIS Oxford Economics Senior Manager and study author Angie Zigomanis, expected all markets to weaken in 2017/18. Recent moves by the regulator to slow growth in bank lending to investors, via reduced interest-only loans, are expected to cause investors to retreat. Price growth is forecast to weaken in a similar way to 2015/16 when the regulator first began to encourage a tightening in lending to investors. Further complicating matters is the rapid rise of new dwelling completions, which is resulting in a growing supply/demand imbalance that will also contribute to dampen price growth. Moreover, the boom in apartment construction is creating a different demand/supply outcome to the housing market in a number of cities, which will impact the house and unit markets in different ways. “New apartment completions in Australia will hit a record in 2016/17, which have been largely bought off-the-plan by investors,” Mr Zigomanis said. Completions will remain high in the short term. A record 231,700 new dwellings were commenced in 2015/16, and BIS Oxford Economics anticipates a further 218,000 dwellings will have been commenced in 2016/17. This will end three years of 200,000+ dwelling starts per year; well above the previous peak of 187,100 dwellings in 1994, and the underlying demand for new dwellings of an estimated 172,100 dwellings per annum over 2017/18 to 2019/20. A moderate slowing in population growth is expected in line with patchy economic conditions and a relatively subdued employment outlook. With the exception of New South Wales, which is heavily undersupplied, all states are forecast to consequently experience varying levels of oversupply through the next three years. Through this period, economic conditions are forecast to be relatively muted. The change in gears from resource investment to domestic demand driving the economy continues to be slow. As new dwelling construction peaks in 2017/18 and falls away from 2018/19, this will be a drag on the economy until business investment takes over as the next driver of growth at the end of the decade. Employment and income growth will be slow, providing limited upside to prices. The outlook will be different from city to city, as well as between the house and unit markets. The unit market is expected to face more challenges than the detached house market in the coming years. Moves by the Australian Prudential Regulation Authority (APRA) to further constrain growth in investor lending will play a part in this difference. “In New South Wales and Victoria in particular, where the strength of investor demand has been a key driver of the Sydney and Melbourne residential markets respectively, the decline in investor activity is expected to impact price growth,” Mr Zigomanis said. The detached house market is less reliant on tenant demand and more exposed to owner occupiers. Progressive cuts to variable interest rates have supported owner occupier demand, with lending to owner occupiers in 2016/17 stabilising at elevated levels. This should continue to provide some support to median house prices as investor demand falls away. The best prospects for median house price growth over the next three years are forecast to be in Canberra and Hobart. Population growth in the Australian Capital Territory has improved, and although there is expected to be an oversupply of apartments, the detached house market is expected to be in deficiency. With the relatively high incomes in Canberra, this should be able to support some house price growth. Hobart has been attracting the lion’s share of Tasmania’s migration and population growth, and Hobart appears to be in deficiency, while Tasmania overall is estimated to be in oversupply. This is expected to allow some moderate house price rises. Price growth in the other markets is forecast to range from limited rises over the three years to 2020, to aggregate declines. While the Melbourne and Brisbane markets are moving into oversupply, new construction has been concentrated in the apartment market, but there is expected to be an underlying deficiency of detached houses. The median house prices in each of these cities are forecast to be slightly higher than 2017 levels by 2020. The median house price in each of these cities is at or below their long-term average relative to Sydney, suggesting they are not significantly overpriced and can support further price rises. Nevertheless, excess stock in the unit sector will dampen housing demand as tenants opt to delay purchasing to take advantage of the competitive rental environment. In the immediate term, there is some downside to the Perth and Adelaide markets due to a soft economic environment, weak population growth and excess supply. Economic conditions are expected to bottom out in both states by 2018/19, while slowing new dwelling activity will also see the oversupply bottom out. An improving trend is expected to appear by 2019/20, with both markets forecast to recover their losses. The median house price in Perth and Adelaide is forecast to still be roughly at 2017 levels by 2020. Darwin will continue to be impacted by falling resource sector investment, weak population growth and excess supply. However, with resource sector investment forecast to bottom out in 2017/18, it is likely that the market will also trough around the same time and potentially herald some limited upside by 2018/19. Sydney’s median house price is forecast be lower by 2020. Strong investor demand has helped to drive both rising prices and new dwelling supply. With much of the pipeline of supply in high rise apartments, new supply will continue to stay high in the next three years as projects are progressively completed. The subsequent easing in New South Wales’ deficiency will alleviate pressure on prices, given they are already constrained from an affordability perspective. Moreover, with investors having accounted for a record share of demand since 2012/13, the impact of a drop in investors coinciding with tighter bank lending policy and the reduced expectation of further capital gains is expected to override the undersupply of dwellings, which in turn is forecast to result in modest price declines. Outside of any negative shock to the economy or significant rise in interest rates, there is not expected to be any significant correction in house prices. Low interest rates mean investors should be able to meet their mortgage repayments despite potentially having to discount rents to attract tenants. 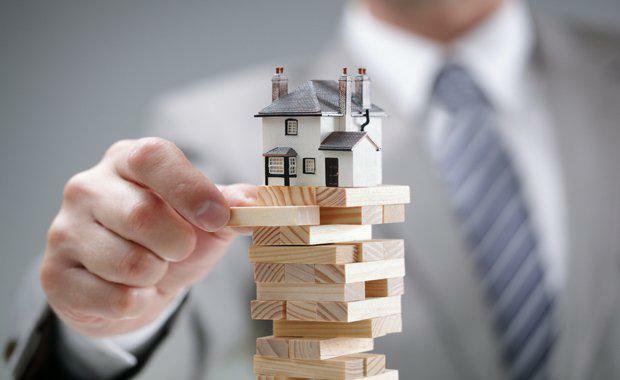 Consequently, owners will be able to hold their properties through this weaker period with few forced sales likely to be taking place to create significant downward pressure on prices. 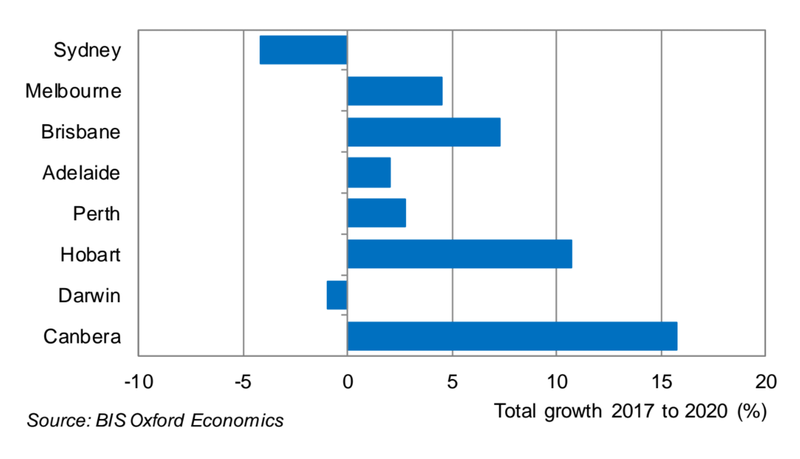 Where state markets are measured to be in overall oversupply, BIS Oxford Economics estimates that the excess stock will be concentrated in the unit sector, where there has been investor-driven record levels of construction. The consequences are already being seen in the unit market, with median unit price growth being below median house price growth across nearly all capital cities over the past three years, while many capital cities have also in this time experienced at least a year where the median unit price has gone backwards. In comparison, median house price growth has been stronger, and a number of markets are still estimated to be in undersupply. While a downturn of the magnitude seen in other countries during the financial crisis is not expected, this does not mean that the markets will not experience a correction of any sort. With the exception of Canberra and Hobart, the median house price in all other capital cities is forecast to experience a fall in real terms by June 2020. In the unit market, real declines are forecast for all markets, ranging from two to 14 per cent over the three years to June 2020.